Pål Eide, born in Bergen in 1970, studied initially at the Royal Danish Academy of Music in Copenhagen and at Moscow’s Tchaikovsky Conservatory. He then returned to his native Norway, where he continued privately in Oslo, with Czech-born professor Jiri Hlinka, whose best-known student is undoubtedly Leif Ove Andsnes. Eide’s first solo recording, “Listen”, released in 2010, featured works by Bach, Arne Nordheim, Jesper Koch and Rachmaninov. The present compilation CD takes its name, of course, from the third track—Liszt’s Nuages gris. It very much shows the essentially high-Romantic composer dispensing with all the technical trappings and bristling difficulties of main works of his youth, looking instead towards Impressionism with its distinctive harmonies and use of scales, as he entered the latter years of his life. 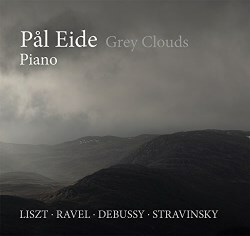 In fact, while Eide does not give any real rationale for his choice of repertoire on the CD, clearly he would seem to have in mind this transition from the late works of Liszt to the two best-known Impressionist exponents, Ravel and Debussy, whose works account for more than half the running time. Psychologists, and especially those concerned with colour, have written extensively on the implications of liking grey, and how this might affect a person’s personality, but this is probably not what this CD and its contents are all about. Indeed, while there is a great deal of “grey” in Nuages gris, the two examples of La lugubre gondola, and parts of La cathédrale engloutie (which does appear correctly spelt in the sleeve note), there is precious little in Liszt’s Consolation No. 3 or Debussy’s Clair de lune—where, and to be fair, Eide does refer to the former as “the encore of this programme”, and the latter as a “pre-impressionist piece”. Eide gives a good account of Ravel’s Gaspard de la nuit, where he despatches the notorious technical difficulties with some aplomb. In fact, the three constituent pieces, Ondine (The Mermaid), Le gibet (The Gallows), and Scarbo (The Dwarf) have been described as a “triathlon” for a pianist, with finger-breaking effects in the first, and dizzyingly fast repeated notes in the third. After Ravel heard Balakirev’s fiendishly difficult Islamey (1869), he decided he could go a step further, and the result was his suite Gaspard de la nuit. Eide does seem a tad hurried in the first two items from his Debussy selection, where both Reflets dans l’eau and La cathédrale engloutie might have been allowed more time to breathe. Not that timing is of the essence here, but his playing time for the latter undercuts, for example, Nelson Freire by well over a minute. Unfortunately, my untried and hitherto sealed review copy ran into severe playing difficulties during La semaine grasse / The Shrovtide [sic] Fair, the third of Stravinsky’s Three Pieces from Petrushka. This meant that the track had to be aborted after some three or so minutes, to avoid any possible damage to my playback equipment. I have not auditioned any other CD from this Danish company, and can thus only assume that this was a one-off rogue copy. Prior to that, and for the final track that follows, both recording and sound reproduction are perfectly fine. Considering the slight reservations over the first two Debussy works, it was good to hear the well-known Liszt Consolation No. 3 given the more expansive reading that this overtly Romantic creation richly merits. The CD comes packed in a card rather than a plastic jewel-case. The sleeve notes (in English and Danish) are reasonably informative about the individual items recorded. Perhaps a more rigorous proof-reading should have identified and corrected the odd typo. If translations of titles are given, they need to be correct and consistent across different languages, especially where proper nouns are involved. For example, Pétrouchka is the equivalent French spelling of our English Petrushka, which again is only a representation in Latin script of the original Russian Cyrillic spelling. Irrespective of the one technical problem I encountered, unless you were really moved to want some of these works all together on one CD, you were a particual aficionado of Eide’s pianism, or, perhaps, were just fond of the colour “grey”, there does not really appear to be a great commercial niche and future for this particular collection.